Acqua-Dent's MDSA is a comfortable, easy-to-use sleep and anti-snore appliance. It consists of 2 trays that fit over the upper and lower teeth. A hook mechanism, made of 316-grade stainless steel, is attached to the upper tray and mates with a shelf on the lower tray, allowing the jaw to be positioned forward. Up to 14 mm of advancement can be made with a key either by the dentist or patient. 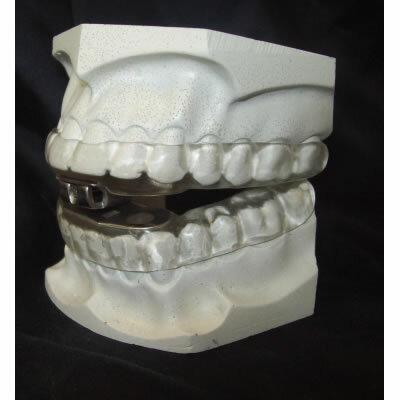 The mechanism also allows for left/right laterotrusion minimizing TMJ/D issues. Unlike other sleep appliances on the market made of vacuformed materials, Acqua-Dent Dental Laboratory will fabricate a custom-made MDSA appliance using the patient's own impressions.